Last season, we drove down to Keene State to watch our 18-0, top-ranked Panthers fall to a talented Keene State team that was hungry for the upset. Middlebury never could pull away from the Owls, and blew a late game lead, failing to score a field goal over the last 6:21 and losing by a final score of 77-76. We came away from that game impressed with the matchup problem that Keene State had presented and the high-caliber basketball that they showed they were capable of playing. That year’s Owls team didn’t end up making the tournament, as they struggled down the stretch, showing a lack of consistency that has surfaced again this season. Joey Kizel had a career game in last year’s loss to Keene State. Photo: WL. Yet inconsistency in an opponent shouldn’t always foster confidence, because a team as volatile and capable as Keene State can play tournament-level basketball on any single night, as they proved last January. Thus, the fact that this year’s Owls team has struggled at times and is sitting at 11-7 on the season does not mean that they should be taken lightly. In fact, Keene State returns all five of its starters from last year’s team, has lost its seven games by an average of 4.6 points (try finding a team in the country that has lost seven or more games by a lesser margin), and has been playing better since moving star senior guard Anthony Mariano into the sixth man role a few weeks ago. This is the toughest non-conference opponent the Panthers will play all season and an upset could put Middlebury’s postseason chances in Jeopardy. The point being, this is a big game, and Middlebury needs to treat it as such. The difficulty that Keene State presents starts at the five position, where 6’10” Rashad Wright dominates with a combination of length, athleticism, and offensive game that is rare at the D3 level. Wright had 15 points and 9 rebounds in just 22 minutes of play during last year’s game, including the game-winning shot with just over a minute to go, and is averaging 11 points, 9 rebounds, 2 blocks and 1 steal per game this year, shooting 55% from the field. Keene State has depth in the frontcourt as well, as 6’6″ senior Eric Fazio (11.6 pppg, 4.7 rpg), 6’8″ junior Montel Walcott (4 ppg, 4 rpg), 6’6″ senior John Boyatsis (4 ppg, 3 rpg), and 7’0″ freshman Nate Howard (2 ppg, 3 rpg, 1 bpg) all earn minutes in the rotation. Rarely does Middlebury face such tall front courts, which is one of the reasons why they may struggle with Keene State. The big guys are complemented by a group of capable scorers, starting with D1 transfer Ryan Martin, a 5’9″ guard who averaged 15.6 points per game and is putting up 50/47/86 shooting splits. Mariano is joined in the backcourt by sophomore Tom Doyle, a 6’3″ shooter who is averaging 9.3 points per game and shooting 45/38/90. Mariano, now coming off the bench, averages 15 points and 4.6 rebounds per contest, and is another efficient shooter at 45/41/87. Two talented 5’11” freshmen round out the backcourt rotation, with Tre’ Tripton and Jesse Lacroix averaging a combined 6 points, 3.5 assists, and 32 minutes per game. In order to stop the Owls, Midd will need Jack Roberts, Chris Churchill, James Jensen, and Peter Lynch to play strong, smart defense on Wright and co. (last year, foul trouble was a huge problem). Roberts will have a chance for redemption after a pretty up-and-down performance against Michael Mayer on Saturday, while Jensen will be counted on once again to step up and play big time minutes. Last season Joey Kizel went off against Keene State (7-11, 4-4, 6-6), and he will get his looks again. Keene State’s perimeter defense is mediocre, and Kizel, Nolan Thompson, and (recently slumping) Jake Wolfin will all be counted on to provide the offense. The outcome might hinge on whether or not they deliver. 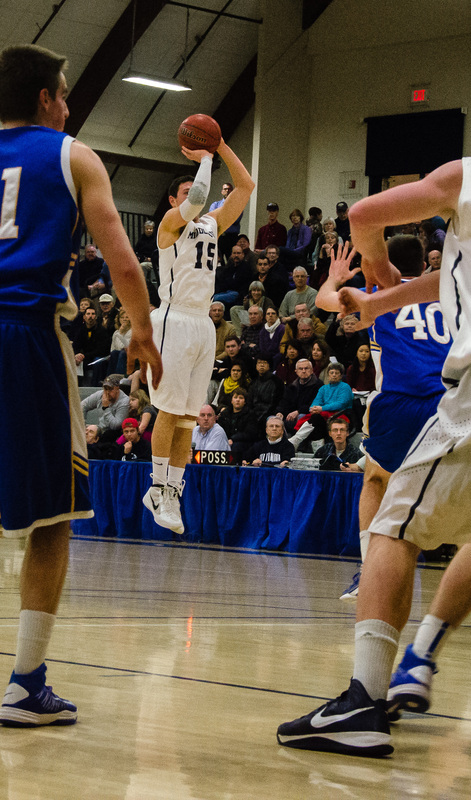 If you have a chance to be at Pepin tomorrow night, Middlebury is going for a white-out from the fans. Last year, the energy that the fans at Keene State brought had a noticeable effect on the game, and it would be great for Panther fans to show that they can play that game too. Damon and I will be broadcasting online, so tune in if you can’t make it to the game. This was written by Jeffrey Hetzel. Posted on Monday, January 28, 2013, at 5:54 pm. Filed under Men's Basketball. Bookmark the permalink. Follow comments here with the RSS feed. Post a comment or leave a trackback. Gents: Scouted Keene last year when they were on the road @ Springfield. They were scrappy , pressing end to end for 40 minutes. Almost dug themselves out of an early 22 to 4 hole but didn’t get there. Then they used the same up tempo tactics and took down #1 (Midd), in their building with their fans racheting up the volume throughout. This year their road record was sort of a mirage. Although 8’W’s appear- their best try was a loss at RIC. Six of their 8 were against teams below .500 and from weaker leagues. RIC with the nation’s longest ncaa streak(6 bids in a row)is well-coached and for real. Their main weakness is that they often have a problem putting the ball in the basket but they can play and will be a tough out in the ncaa’s. Back to K.St.- this year’s edition doesn’t have the chemistry of last year. The why is unknown but I do know that every year is different and it has to be established. They only semi-pressed and Midd went at them early in the open floor and down low. Although Wright is physically impressive, my take last year was that he was soft, and he did nothing last nite to change that thinking. Peter ate him up. Joey and Jake pushed the ball well, found the cutters, and stayed in control. Let’s hope Joey’s ankle is okay going forward because he is the glue on ‘O’. This was over early with the 11-0 run to make it 28-11. Nolan’s work on ‘D’ was another defensive gem. Martin- their leading guy- didn’t get his first bucket till 26 minutes had passed. If the triggerman is gone, the offense breaks down. Nolan ate him up like he was a dot in a game of ‘Pac-Man’. It also seems that when Nolan puts forth these huge efforts on ‘D’, he doesn’t score as much, but that is a tradeoff that we can live with. BTW- probably the main reason that Nolan wasn’t the DPOY in nescac last year was because he missed at least the first weekend of games and may not have had enough to qualify under league standards. Liked the way that ‘LongJack’ is coming on. Played with more assertion on both ends. His next step forward will be to realize he’s got to be in front of his guy down low. When he starts doing that he can alter the opponent’s attack. Big trip coming- Maine is never easy. The PolarBearNation will be in full voice, think our edge with the best G. trio in the country and down low with Lynch’s ‘O’ should be enough on Friday. And there should be no excuses at Colby, they are undermanned, but the road is the road. Clubbo. We may not get a chance to see the Colby game? They have not posted a webcast link, nor anything for live stats. I hope that changes! Still not up. Pretty disappointing.